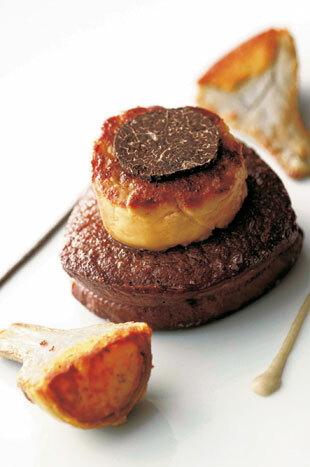 Tokyoites are generally spoiled by the wealth of so many outstanding French restaurants available. Many Michelin-starred chefs from France have outlets in Tokyo; Joel Robuchon, Pierre Gagnaire, and Michel Troisgros, to name but a few. Included with this group is chef Thierry Voisin, who came to The Imperial Hotel to run the kitchen at Les Saisons. Chef Voisin had a successful career at the lauded Les Crayeres in Reims. He recently celebrated five years in Tokyo. Les Saisons is up the grand staircase on the hotel’s mezzanine level and a warm welcome awaits guests as they are escorted to the peaceful sanctuary. The dining room, refurbished five years ago, is spacious, and comfortable. The legendary hotel, opened in 1890, has a history of first class service and this shines through in the restaurant as well. The staff all speak English (as well as French), and they’re attentive without hovering. Les Saisons’ clientele includes Japanese executives (often in a private salon), well-coiffed ladies who lunch, couples celebrating special occasions, as well as seasoned gourmands. The menu is filled with French classics like Filet of Beef Rossini—Japanese beef filet topped with foie gras and black truffles, and sautéed sweet langoustines garnished with French morel mushrooms. Chef Voisin’s use of local ingredients are often showcased in his offerings which include trout from the pristine waters near Mount Fuji served with yuzu, Hamanako fresh water eel that is smoked and served with foie gras on a puree of celery and a fruit vinaigrette, and a confit of Japanese oxtail with beef tongue, marrow, and mushrooms. Les Saisons has one of the best cheese carts in the city, so remember to save room for the cheese course. The wine cellar as well is very impressive with a vast collection of wines, including older vintages. The course menus offer the best value for price. Lunch starts at 6,800 yen for three courses or 8,000 yen for four courses and dinner starts at 16,800 yen for five courses. A la carte menus are available also. This first appeared in the American Chamber of Commerce Journal.